Rated 100% based on 21 reviews. The perfect holiday destination for travelling families, groups or couples to get away from it all, Edinburgh allows visitors to soak up the very best of Scotland’s exquisite landscape scenery whilst enjoying the local attractions each has to offer. So whilst you’re there why don’t you spoil yourself by staying in a luxury holiday apartment? 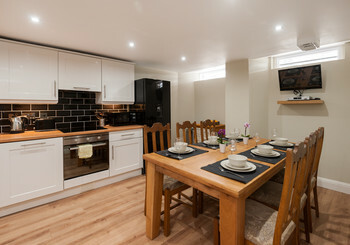 Reserve Apartments provide a range of accommodation options to rent in Edinburgh for all sizes of travelling parties, providing you with your own unique slice of luxury, privacy and home comforts. With our wide variety of holiday apartments you can choose from a range of holiday options including a long or short stay such as a romantic weekend break. With a wide variety of apartment and bedrooms options on offer, our accommodation provides all the necessary amenities including WiFi, Washing Machines and even a Gym and Games Room in some cases. From 1 bedroom all the way up to 16 bedrooms we have an exceptional range of private home stays which provide you with the privacy of home and the benefit of having luxury resort amenities on your door step. And if it’s a sea view or roof terrace you’re after, don’t worry we’ve got that covered as well! If you don’t like all the hustle and bustle of the Edinburgh city centre you can stay in those areas slightly further afield such as Morningside & Stockbridge which also offer plenty to do such as markets, theatres and restaurants. Don’t worry about transport because with an abundance of relatively inexpensive options such as buses, trains and trams and the slightly more expensive taxis you’re more than covered for getting around. Your best chance for good weather is as you’d expect around summer time however don’t forget that the Edinburgh International Festival is on during the month of August so book well in advance! When it comes time to book your holiday accommodation, opt for the luxury option with Reserve Apartments for an unforgettable time away with friends or family.